The little furry guy has spoken- We should expect an early spring!! Who else is excited for that? I know my friends in the South getting pounded by ridiculously cold temperatures are juts as excited as us dealing with snow and ice in the North! So, in honor of Spring being just around the corner, I wanted to start a New Giveaway!! Thanks to our friends over at Pixie Vacations (.com), we're offering a personalized beach tote bag, perfect for a quick day trip, or even hitting the pools at your favorite Walt Disney World Resort. And, if you're planning a trip, let Pixie Vacations help you plan! They can help you find all the discounts available and save for your next Disney Vacation and more! Let the pros - many former cast members - help you make the most of your money by planning a wonderful trip for you and your family/friends! And a personal thanks for the giveaway! Hi! I just 'liked' Pixie Vacations & Disney Babies Blog. Hi! I follow you on twitter! I "like" your blog and Pixie Vacations on FB! I follow on Google friend too! I liked both of you on facebook! entry #1!!! I follow you on twitter! entry #2!!! I mentioned you in a tweet! entry #3!!! i liked both of them on facebook!!! Oh I almost missed this, been sick and not on the computer. But it is so cute and I made it!!! I liked them both so an entry for me, please. Thanks!!! Charlotte Fawcet:....I just "liked" Disney Babies Blog and Pixie Vacations on Facebook. 1 entry for me please. I follow here on Google Friend Connect (name is Jenn @ Middle of Mommyhood). Okay, I messed up and did the facebook "like" entries in separate posts, so I deleted them and am now telling you that I like both of you!! I follow you on twitter (@middlemommyhood). AAAAND...your button is now on my blog. I love your blog and I "liked" Pixie Vacations as well! Great prize you are giving away! I tweeted again about your giveaway... does that count for another shot at the bag?! 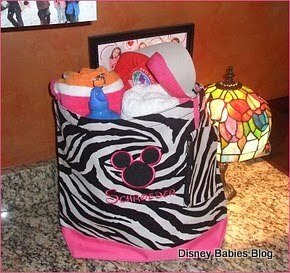 I just Liked Both Pixie Vacations & Disney Babies Blog. Thank you. Google friend connect completed. Looking forward to viewing your blog posts.